The disciples of Saint Michael perform the miracle of "wealth redistribution". It's been several weeks since the funeral of Saint Michael Brown, and he has yet to rise from the dead. Maybe the timing isn't right yet, the wait continues. In the meantime, some of Saint Michael's disciples have decided to continue the life's work of Saint Michael by performing miracles in the name of their prophet. The legend of Saint Michael has spread across the nation since his death. He was seen performing miracles like healing the store owner from being possessed and also making a box of cigars disappear almost like if by magic. Though his disciples aren't the real thing, they have taken it upon themselves to try and spread the word of Saint Michael in their own unique way. Saint Michael's deeds have inspired people long and wide to try and duplicate his deeds..For example, two men, one wearing a mask recently robbed 6 people at gun point of their property in Saint Louis.Of course they were going to give that property to people who needed it m more I'm sure. These two individuals were no ordinary thieves They were the disciples of the gentle giant Michael Brown. They made sure to let people know that their humanitarian act of wealth redistribution "was in the name of Michael Brown" via gunpoint. It's still unclear whether the two disciples/suspects were spreading the word of Jesus Christ also as Saint Micnael's family and friends said Michael was the day he was killed. According to the wisdom of Bill Maher, Fox News is "polarizing the nation". they never really can never say how exactly Fox News is polarizing the nation, just that it is. Remember they made the exact same claim about Sarah Palin. To my knowledge, I can't recall ever hearing of a liberal being called polarizing, go figure on that one. Of course with the left, facts are an inconvenient nuisance. The seriousness of the charge is all that matters to them. Now if you challenge them on their tall tales, then they will resort to calling you either a racist, sexist, bigot whatever in an attempt to deflect attention off of their inability to back up their claims. Fox News is only ONE channel on cable, ABC News, CBS News, NBC News, MSNBC, and CNN are all progressive in their reporting not just in commentary like Fox News. One fact liberals can't dispute is that "more liberal commentators are on Fox News then conservative commentators are on CNN and MSNBC COMBINED". Yet with liberals literally controlling most of the media from print, network and cable, they can't help but to obsess over little ol Fox News. Liberals can't stand competition in the free market, because they always lose. The liberal radio network Air America dubbed itself many years ago as the "answer to Rush Limbaugh", yet it ultimately crashed and burned to Limbaugh and conservative talk radio. The only reason why Progressive National Public Radio is on the air is, because it is sucking off the tax payers. It doesn't have to survive on ratings like traditional radio stations. Liberals can't whine about Fox News all they like, they will never beat it. CNN dubbed itself "the most trusted name in news", well those days have been gone since the 80's. CNN should call itself the pink channel due to how many people over there are getting fired almost on a constant basis. CNN isn't just in last place, they have owned last place for over a decade now. As for MSNBC, does this sound like a news channel to you? Lean Forward right? Another word for forward is "progress", Lean Progressive perhaps? The folks over at MSNBC can be described using several words, "nuts,, looney, mental, warped and delusional". MSNBC is the liberals mecca. When liberal politicians or the Obama White House wants to get it's talking points out, they go on MSNBC, because they know they will never be challenged on them. They can pedal as much bull crap and the hosts will eat it up with glee and ask for more. CBS, NBC & ABC are do different. They are mere propaganda mouth pieces for the Democratic National Committee and the Obama Administration It's no wonder that the public trust in the media is at an all time low. Yet we all are suppose to believe that the problem rests with just one news channel, Fox News according to Bill Maher. Greg Gufeld co cost host of the Fox News show "The Five" and the host of "Red Eye" responded to Bill's assertion that one cable news channel has the power to "polarize the nation". No Justice, No football in Saint Louis? 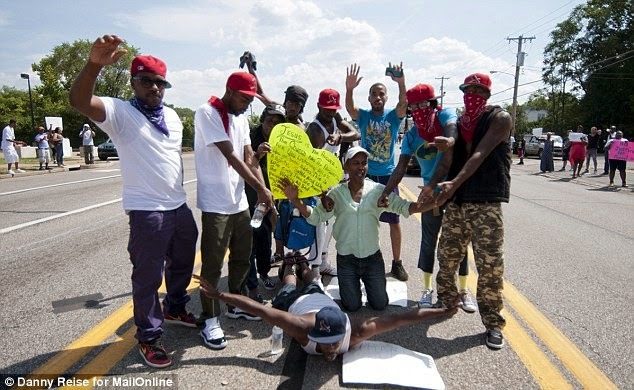 It looks like the disciples of Saint Michael Brown are not happy. Forget the justice system and due process under the law. They want officer Darren Wilson arrested, even though no evidence has been presented to warrant his arrest. With that being said, the angry mob of the gentle giant are now planning to go to even more extremes to get noticed. Now they are stating that if Darren Wilson isn't arrested and certain public officials don't resign, they will disrupt the NFL Football game tomorrow between the Saint Louis Rams and the Dallas Cowboys. .I wonder do these morons truly believe that the legal system is going to ignore due process about the rule of law and simply arrest Darren Wilson just so there will be no disruption at a football game? If Brown's disciples truly plan on causing trouble Sunday, I say they should go for it. If they act out like the fools they have shown themselves to be, they will have even more people people pissed off at them then they do now. Just like how the Occupy movement managed to turn the public against them by their acts, the Furgerson malcontents will do the same thing. I doubt the folks in Saint Louis are going to allow their city to be put in a negative light by the elf serving mobs. To make matters worse or actually more laughable, they are also threatening to disrupt the World Series if the Saint Louis Cardinals make it to the World Series. Tomorrow will be interesting to see if the Saint Michael crowd are true believers willing to go through with their stunt. Some idiots of this planned protest actually want ticket owners to "donate"their tickets so that they can protest inside the stadium! I am 1,000% convinced of that. Just listen to the racial agigators both black and white who say the most insane, ridiculous and venomous remarks to flame racial tension. Most Americans just want to live in peace and focus on their own lives. Their top priorities is paying their mortgage, rent, car note puttying food on the table etc. Unfortunitely, there are other people who are too busy worrying about finding the "racial boogeyman". The racial boogey man is the invisible monster that goes around spreading racism everywhere it goes, and for some reason only progressives can see it. To them every word that is said against Obama must be of racial intent of course. If he's called a socialist, the joker. Community Organizer, they all must be "racial dog whistles" by the right. They never look at themselves as the true problem. Their collective heads are so far up their butts, they can't see, and they sure can't smell the obvious. For example, when have anyone ever hear liberals talk about racial unity and harmony? Never, have those words ever roll of the tongues of Sharpton and Jackson and people on MSNBC and CNN? Of course not, Obama's Attorney Gernera called Americans "cowards", when it comes to race. Feel the love right? There is a website called FCKH8.COM (I wonder what that could mean, sarcasm).. It is rying to make money off of the misguided anger of blacks caught up in the police involved shooting of Saint Michael Brown. Liberals tend to think they are so smart and witty, yet they truly do not have a clue to how stupid they come off sounding to rational thinking people. The investigatyion in the shooting of Saint Michael is on going, but according to these little kids age 5 to 13, white folks just don't get what racism is. So we are to believe that a group of black children aged 5 to 13 knows more about racism then white adults? When I first saw this video, I just had this odd (what the hell did I just watch) look on my face. It was so absurd it made absolutely no sense. Kids being used for propaganda isn't new, it should be considered child abuse though. That video reminded me of how Palestinians brainwash and exploit their kids to hate Jews and Israelis. And don't forget folk that over at FCKH8.COM, the TShirt does little kids in the video who are not old enough to drive, drink, vote, smoke but are experts on racism are for sale!! Like any good progressive racial agitator, what good is causing racial tension if you can't make a profit off of it? I decided to add a second part on this topic, because there were some other things I wanted to add that I didn't in part one that needed to be have been said. It's no secret that progressives need a villain in order justify their shortcomings in life. Taking personal responsibility is not an option. This is what this whole $15 dollars an hour mess is truly about. It's the underlying issue they don't want to address. The one thing the burger flippers and people who work at low paying jobs never want to talk about is that "they agreed to work for their employers knowing what the job would pay". The way they try to frame this is almost as if their employers did some sort of bait and switch on them, and they were shocked and angered , when they looked at their first paycheck. Burger flippers and any other employees are known as "at will employee". In other words, they are not slaves. They can end their employment anytime they want with their employer, and the employer has the same right to end the employment of an employee at anytime as well. So with that being said, there is nothing holding back burger flippers from seeking out jobs which pay more money right? Again with that being said. 1.Why do they chose to accept jobs that are low pay but then later complain about pay they accepted? 2. How is it their employer fault for them choosing to apply for the low paying job in the first place? 3.What is stopping them from going out and finding a job that pays "a living wage"? They simply chose not to. People who are making $15 dollars an hour, $20, $50 dollars an hour or more obviously knew what they had to do in the marketplace to get paid their salary. It wasn't simply handed to them on a silver platter. The progressive malcontents don't want to do what others have done to earn a living wage. 1.Why do you think that skilled and highly skilled people don't work as burger flippers? 2. Why do you think these people will more then likely always have jobs paying them a "living wage"? "work hard at acquiring the skills necessary so they can be qualified to make a living wage"
But I forgot, that requires dedication, sacrifice and hard work. In other words, it's all on the individual to achieve that. Can't blame the employers, Republicans, conservatives or the Tea Party for their life choices. My favorite talk show hosts is Dave Ramsey. He's a financial consultant and expert on helping people budget money and getting out of debt. He's an insanely down to earth person. He went on an epic rant a few months ago about who he calls "whopper floppers" wanting $15 an hour and why people are paid what they are paid which also includes CEO's and sports athletes. Highly recommend watching! Fast Food workers strike for $15 an hour but do not want to go out into the market place and earn it. You all may have noticed yesterday or maybe you didn't, but supposedly tens of thousands of fast food workers went on strike across the country demanding $15 dollars an hour. I didn't know that non union workers could strike, apparently they can, go figure. These type of people really irk me. They really get under my skin for several reasons. These people who feel they should make $15 an hour for doing a job that requires basically zero skill to do are clueless, and they have zero concept of how economics and business works. These people's sheer ignorance explains how the unions are able to play these dim witted malcontents for perfect suckers. Union memberships are at an all time low in the United States. Without union members there are no union dues. Without union dues, there are no rich fat hog union bosses. As always follow the money. So one way for the unions to try and replenish their hemorrhaging ranks is to try to gain new members in other non traditional union sectors. So the food service unions are pumping this notion in the minds of fast food workers that they deserve to make $15 an hours. I am a free market capitalist, and I am a staunch supporter of the free market. This elementary concept is what drives the cost of labor,yet this ultra simplistic concept is one in which progressives have a hard time wrapping their minds around for some reason. The concept is this. "Supply vs Demand" is what determines how many people find jobs in the labor market, but it also determines how much they are worth in the labor market. Flipping a hamburger or making French fries isn't rocket science. It may sound harsh, but it's the truth. A person who works in a restaurant on the other hand as a Chef makes good money. Why is that? It's because the Chef spent so many years in Culinary School learning the skill of preparing culinary dishes. His or her skill is marketable and is in demand by restaurant owners thus they are willing to pay the market rate or more for his or her skill and knowledge. A fast food worker doesn't have the skill that a Chef has thus that worker is not entitled to be on the same pay level as a Chef. It goes back to common sense, which these people clearly either do not have or are not exercising. This is the mindset of liberalism as it pertains to business. The one thing you'll notice by listening to liberals like her and others who think like her is that it's always the fault of the big, bad, greedy evil fast food restaurants . Of course the real problem is never them, nah. Typical liberalism, somebody or something else is always the bad guy "holding them back". In their convoluted minds it never occurs to them that they are the reason they are getting paid what they are. Here are three questions. 1. Why do people go to college? 2. Why do people go to learn a trade? 2. Why do people start their own business? All three questions have one common answer. They do it in order to "make more money". It's like duh!! So how come these malcontents who work at fast food restaurants haven't figured out what so many others already know? This comes down to the progressive principal of "wanting something for nothing".. They want to make close to $30,000 a year, but do not want to apply themselves in the market place to legitimately earn it. That's what it comes down to. Why should they be close to earning on par what Secretaries, Dental Assistants, Financial Clerks, Construction Workers, Bus Drivers etc make? All the professionals I mentioned requires the applicant to have a certain skill set for the job. As the unions are leading these poor souls by their noses down the road of the illusion that they will make $15 an hour doing a minimum wage job, they better be careful, because this is what's ultimately waiting for them at the end of road if they chose to continue to stay on it.